It is easily to activate or customize the screen saver in Windows-8 / 10 or 8.1 via the screen saver "screen saver settings" in Win 8.1/ 10 / 8! control.exe desk.cpl,screensaver,@screensaver (... See Image-1 Arrow-1). you can easily adjust (customize, activate, disable) the Windows 8 screen saver. You can also, via the Windows 8 desktop click, customize the screen saver. Please press the key combination [Win-Logo]+[D]. Right-clicking via mouse on the desktop to display the context menu. Here simply select "Personalize" to open the window with the "Personalize" Window. Here at the bottom right area please click "Screen Saver". How to Start Screensaver Immediately in win10 or 8.1? How to get Screen saver back in Windows 8.1? Windows 8.1 or 10 default screensaver settings, screensaver for win 10 or 8.1? How to in Windows-8.1 or 10 enable, disable, or adjust the Screen Saver. Where are the screensaver files in windows 10 or 8.1? Command to start screensaver in windows 8.1? How to download windows 8.1 screensavers? Run Screensaver settings in windows 8? Windows8.1 screen saver softwere do? How to change folder type from screen saver to folder file in Windows 8.2? How do i turn the screensaver off in windows 8.1 eg. windows 8.1 start screensaver.exe error? How to turn off screensaver windows 8.1, how to delete screensaver in windows 10 or 8.1? Windows 8.1 location of screensaver images? Windows 8.1 or 10 screensaver folder eg. samsung screensaver win8.1? Where do yoou place a screensaver picture windows 8.1 or 10? Startscreensaver.exe windows 8.1 error and how do you delete a screensaver in windows 8.1? Windows 8.1 or 10 screensaver image location or/and how do to avtivate the screen saver on windows 8.1? Unable to change screen saver windows 10 or 8.1? Windows 8.1 desktop disappeared screen saver? Activate screen save in windows 8.1? How to set up windows 8 to start screen saver? Run screensaver from command line windows 8.1? Why is my windows 8 laptop screen saver not activating and locking my keyboard? Windows 8.1 or 10 screensaver settings? Disable screen saver in windows 10 or 8.1? How yo disable screensaver on windows 10 or 8.1? Find the Windows 8 screensaver settings? Screen savers for windows 8.1 :-(? Activate screensaver in windows 8.1? How to turn on screensaver windows 8.1? Turn off screensaver commandline win 8.1? Activate screensaver manually from touch screen? What is the command to activate the photoscreensaver.scr? Screen saver settings location 8.1? How to initiate Screen saver manually? I cant open my windows 8 off of my screen saver? Setting screen saver windos 10 command line? Automatic Fire With Smoke Black Scree? Windows 8.1 screensaver files, salvapantallas windows 8.1? Windows8.1 screensaver settings plus does window 8.1 need screensaver? Where do I set my screensaver in Windows 10? Screensaver locations win 10 or 8.1? Screensaver does work on windows 8.1? Open Windows 8 Screen Saver Settings? Widows 8.1 screensaver settings, windows 8.1 or 10 activation saver? Adding screen savers from downloads to 8.1? Find Windows 8.1 Screensaver Settings? Open the Screensaver Settings Windows 8? 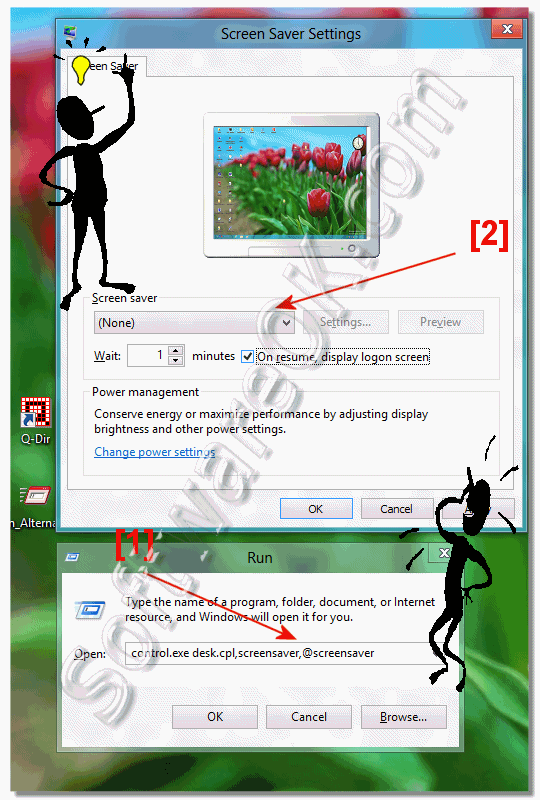 How to activate screensaver in windows 8.1? How do i stop the screensaver in windows 8.1 from start menu? Screen saver not working in windows 8.1? How to manually activate screen saver in windows 8? How to change screen timeout reviews on windows 8.1? Scree savers for windows 8.1? Screensaver para windows 8.1 64 bits and location screensavers in windows 10 or 8.1? Windows 8.1 how can I find the folder the screen saver video is in? Where is the screen saver file on Windows 10 or 8.1? Screensaver windows 8.1 turns=1 eg. how to enable screensaver in windows 10 or 8.1? Screen saver in windows 10? How do i remove screensavers windows 8.1 or win 8.1 metro screen saver? How to find screensaver on windows 8.1 or 10, screensaver logo windows 8.1 or 10? Windows 10 Screen saver settings? Why in Windows 8 my screansaver does not opento my dest top? Where is the screensavers in windows 8.1? Windows 8.1 or 10 screensaver network path not found? Where to find screensaver folder windows 8.1? Setup screensaver windows 8.1 professional and .scr file remover software for win 8.1? How do i set the screen saver time in window 8.1? How do i find screen saver folder on windows 8.1? Does window 8.1 allow screen savers? Screen savers for windows 8.1? Windows 8.1 screensavers in metro mode? How tio enable screen saver in windows 10 or 8.1? How to switch screensaver manually in windows 8.1? Why can't i use a screensaver win 8.1? Win8.1 disable screen saver, screensaver file window 10 or 8.1? Command.com screen saver in windows 8.1? How do I put a photo as my screen saver on windows 10 or 8.1? How to control time screen in windows 10 or 8.1? How to activate screensaver in windows 8.1 and remove a screensavers windows 10 or 8.1? Screensaver settings in windows 10 or 8.1? Can you put screensavers on windows 10 or 8.1? Screen saver cannot find pictures windows 8.1? How to automatically start screen saver windows 8.1? How to find screensaver folder windows 8? Screensaver windows 8.1 or 10 domain?